As a gamer, [Lexie Dostal] dreamed of a smartphone that was a viable gaming platform: something with enough power to run the games and emulators he was interested in, with the controls to make playing them feel natural. So when he got his hands on an early version of Kite, the modular open hardware platform designed to be hacked and customized, that’s exactly what he decided to build. The Kite kit would provide the touch screen and Android-equipped motherboard, he just needed to design a case and integrate controls to make it a real gaming device. The case design [Lexie] came up with is inspired by the bottom half of the Nintendo 3DS, and ended up only a few centimeters wider than the stock case from the Kite kit. Unfortunately, his delta 3D printer wasn’t large enough to fit the device’s case, so he ended up having to break it into five separate pieces and glue them together. With the case in one piece he worked his way from 220 to 400 grit sand paper, filling any voids in the print with glue as he went. A few coats of primer, more sanding, and a final matte texture spray give the final case a very professional-looking finish. Not only was the Nintendo 3DS an inspiration for the device, it was also a donor for some of the parts. The directional pad, analog “nub”, and buttons are replacement 3DS hardware, which is interfaced to the KiteBoard with an Arduino Nano. When he couldn’t find springs small enough to use for the shoulder buttons, he bought some thin music wire and wound them himself. Talk about attention to detail. There’s quite a bit of gear packed into the case, but [Lexie] thinks there’s probably still room to make some improvements. 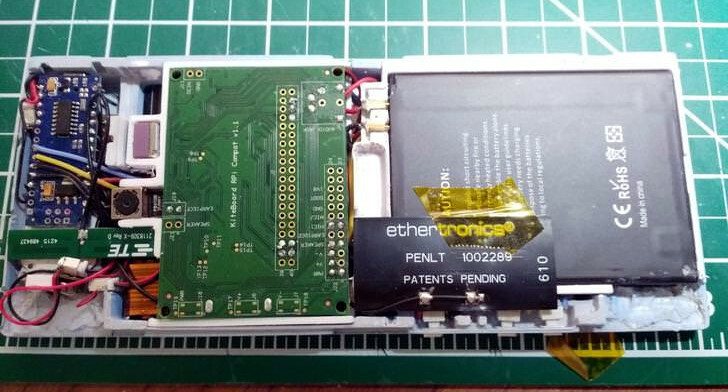 He could free up some room by dropping the connectors and soldering everything directly, and says he’d like to come up with a custom PCB to better interface with the 3DS’s hardware to cut down on some of the wiring required. With the extra room he thinks the battery, currently a 3200 mAh pack designed for the LG V20 smartphone, could probably be replaced with something even bigger. Readers may recall that the Kite is currently in the running for the 2018 Hackaday prize. Seeing Kite already delivering on the promise of making it easier to develop powerful Android devices is very exciting, and we can’t wait to see what else hackers will be able to do with it. The Isle of Lewis is the largest of the Scottish Outer Hebrides, sitting in the North Atlantic off the west coast of the Scottish mainland. It is the first landfall after thousands of miles of ocean for a continuous stream of Atlantic weather systems, so as you might imagine it is a place in which there is no shortage of wind. It is thus the perfect situation for a wind power startup, and in the aptly-named Windswept and Interesting Ltd it has one that is pushing the boundaries. Their speciality is the generation of power from spinning kites, arrays of kites that transmit power to a ground-based generator through the rotation of their lines, and because they release their designs as open source they are of extra interest to us. Of course, if you are a seasoned reader you’ll now be complaining that we’ve covered this story before when they had an entry in the 2014 Hackaday Prize, so what’s new? The answer is that the 2014 story was a much earlier iteration than their current multi-level kite array, and that they have now reached the point of bringing their products to market. You can buy one of their prototypes right now, and there is a soon-to-be-launched crowdfunding campaign for their latest model. It’s not exactly cheap, but this first product is the result of 5 years of product development, and it is pretty obvious that more is on the way. For any open hardware startup to stay afloat that long is an impressive achievement, to do so in a field in which you are not surrounded by a huge supporting industry in the way for example electronics startups are is nothing short of amazing. If you would like to have a go at building one of their spinning kites, you can do so with full instructions released under a Creative Commons licence, but for non kite builders their website is a fascinating read in its own right. Their YouTube channel in particular has a wealth of videos of previous tests as well as design iterations, and is one on which many readers will linger for a while. Below the break we’ve put one of their most recent, a montage showing the kite evolution over the years. [Waalcko] fell in love with kites when he was 13 years old. He saw a NASA Para Wing kite fly and couldn’t get it out of his head. Now, years later, he shares how to build a circular foil kite design he came up with. We’re all particular about our chosen hobbies. Some of us like one design direction and hate another. For [Waalcko], he really hates internal supports in kites. When he spied a single line kite in a circular foil configuration he was enraptured, but the design had those hideous spars. So, he got to work and pushed himself to the limit coming up with a kite that was a circular foil, flew with one line, and had no internal supports. His instructable is a great read and goes into deep detail about the basics of kite construction. (After reading it we’re certain that even the shallows have depths when it comes kites.) It goes through the terminology used when talking about kits, the techniques used to assemble them, the common problems, and more. Many hours later, if all goes well, one should end up with a really cool kite. The basic idea of generating electricity from a kite is to fly it around in figure-eights while unwinding the kite line from a spool. The very strong forces on the kite lines can be used to drive a generator which provides power for reeling the kite back in at a lower angle of attack. You can check out [Adrien]’s kite power theory page for a few more details on how this works. Right now, [Adrien] and his team have a basic rig set up to generate power and are flying the kite via a joystick. Updates are coming, and you can check out the video of their RC kite in action after the break.